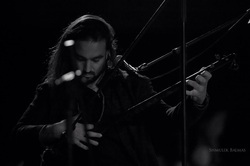 Whether it's playing and mastering the traditional music and theory of Central Asian Music or Bluegrass, Folk and Blues from Nashville to Chicago, Aviv Behar is unique in his ability to be comfortable in virtually any style of music. After studying at the prestigious Rimon School of Jazz and Contemporary Music with jazz and theory masters, Aviv set his sights on becoming versed in a wide variety of ethnic and roots music both Eastern and Western in origin. Reggae, funk, rock, jazz, flamenco, celtic, and classical guitar round out some of Aviv's influences. Playing and mastering the "maqam" system of music from Azerbaijan, Armenia, Turkey and Iran, including instruments like the oud, kopuz, tanbur, saz, and dutar, has made Aviv one of the most sought-after musicians for acts that are based on those and other related middle and near eastern styles of music. Aviv is a founding member of Diwan Saz, an international ensemble that has participated in some of the largest World Music Festivals and he has shared the stage with such noted musicians including Ross Daly, Peretz and Mark Eliyhu, Amir Sha'asar and world-class dancers like Miriam Peretz. He is currently working on a project with Hadas Kleinman (Asaf Avidan, The Voice Israel, Shlomo Artzi) scheduled to be released in April 2014. This album promises to be a masterful recording of original music including guitar and violin-cello instrumentation and masterful lyrics and harmonies. Born in Rehovot, Israel, Talya G.A Solan is one of the fresh, fascinating voices in the Israeli World Music scene. She is a graduate of Tel-Aviv University's Art Faculty, and a student of Mrs. Rachel Hochman. In 2004 Talya established the Israeli Ethnic Ensemble and began performing, focusing on a Gypsy & Balkan repertoire. The ensemble developed a unique style incorporating ancient Jewish sources, contemporary Israeli music, original material and local Arabic & Balkan music. The colorful Mediterranean tapestry presented by the ensemble enhanced the curiosity of international world music programmers and the group was invited to various festivals in Italy, France, Croatia, Czech Republic, Bulgaria, Malta, Slovenia, Poland, Bosnia Herzegovina and the USA. Talya took part in many fascinating collaborations including the 21 songs of love concert with Krakow Modern Symphonic orchestra, Lalya B'Canaan with Jean-Louis Matinier, Zohar Fresco, Itamar Erez and Avri Borochov and with the international group of 7sois 7luas Festival featuring flamenco singer, Juan Pinilla Martin. Talya’s is a versatile and multi-dimensional performer. Her unique ability allows her to elegantly glide from Yemenite trills to Bulgarian folk songs. She expresses her deep and broad musical roots through her singing and the audience gravitates to her curious, welcoming soul. Talya’s performances emanate from a wide variety of traditions and musical heritages: folk songs, Gypsy songs, the Judeo-Spanish (Ladino) music, liturgical songs for holidays and weekdays from Jewish religious texts (the Song of Songs, verses from Psalms, etc.) and other songs of roots and tradition form the basis upon which Talya establishes her performances and her musical materials. For years, the members of Faran have gathered every week in a quest to express their musical and spiritual journey. Having studied with some of the finest World Music teachers and musicians, Faran’s original compositions incorporate the music from all over the Middle and Near East. The Faran Ensemble members grew up in a variety of backgrounds and environments. From the dry desert, to the green landscapes of hills, rivers and valleys to the inner city. The Faran musicians are all deeply influenced by the Eastern musical system called ‘Maqam’. Maqam is translated as both a place or state of being as well as a technique of improvisation that defines the pitch, patterns and development of Arabian music. The Faran Ensemble brings the listener on a journey, both physical and spiritual, to many places and times. A Faran is the name of a dry desert wadi or tributary that fills up with water and life during the Winter rains and becomes dry and empty of active life during the hot Summer months. The Faran crosses the Land of Israel on its journey throughout the Middle/Near East ignoring all borders. ANISTAR was formed in 2002 by composer, saxophonist and clarinetist Harel Shachal to explore the classical and traditional music of Middle Eastern and Balkan worlds from the perspective of New York downtown jazz. This ensemble seamlessly fuses elements of ancient and modern in its instrumentation and repertoire. The improvisations of Harel and the band seal this fusion by uniting the language of desert music with the aesthetic urgency of urban dwellers. Harel's playing, evocative of Samir Srur and Mustafa Kandirali merged with Coltrane and Dolphy, creates the cornerstone of ANISTAR's sound. The string section of Violin, Accordion, Oud, Cumbu, Acoustic Bass, Three Percussionists and Cello provides the core of the ensemble sound, invoking the great Arabic orchestras in one piece and a Gypsy configuration in the next. Filled out with Accordion and propelled by a traditional percussion section, ANISTAR has the muster to whip a crowd into a dancing, ululating frenzy, or just as easily hush a room with introspective Taksims from any of its gifted soloists. Anistar received international acclaim at the 2012 Eilat Jazz Festival and the Harel continues to explore the fusion of East and West with an expansive songbook arching from classic selections in Arabic, Turkish, and Greek repertoire to original compositions injecting a fiery jazz-edge into these traditional elements. This band will have you dancing from SoHo to the Silk Road and leave you with a smile on your face. Diwan Saz is a unique ensemble from Israel who have developed a special connection with the musical traditions of central Asia. The melodies and texts incorporate the spirit and music of Sufism and the musical heritage of the Holy Land. Diwan Saz explores this music in depth, playing, composing and transposing texts and melodies from the various ethnic and folk traditions. Yohai Barak, who leads the group, plays Saz and Baglama. He has traveled around the world studying music with outstanding saz players and musicians such as Mehmet Erenler in Turkey, Ross Dali in Crete, and Peretz Eliahu. Yohai joined together with leading musicians in the field of World Music as Diwan Saz. The Unfathomed Depth Project and CD was the fruit of five years of creative collaboration. 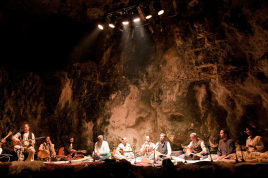 Born inside a huge bell-shaped cave in the ancient village at Tel Yodfat, the carefully selected lyrics and melodies are from traditional sources, played in the ancient scales, and enhanced with original compositions and improvisations. The ensemble often performs special musical productions in a natural environment. Diwan Saz invites notable performers of World Music to join them on stage: Ross Dali, Kelly thoma, Said Tarabiyeh (Arab vocals), Mark Eliyahu (kamanché), Kutla khan, Itzhak Refuah (Persian vocals), Amir Shahsar (persian ney and vocals), itamar duari (percussion), Udi Ben Kna’an (Lira), Rabbi and poet David Menahem, Shai Ben-Tzur and Miriam Peretz (Sacred Dances of the Silk Road), to name a few. Diwan Saz also collaborates with local Bedouin Arab musicians such as Abu Hani Taib (yar’oul) in accordance with their philosophy of welcoming other cultures. A Diwan Saz performance is an unique experience, often with a large number of musicians. The variety of instruments, and a special way of listening to each other, creates an intense and vibrant atmosphere. During the performance (in 5 languages:Hebrew, Arabic, Aramaic, Turkish and Persian) elements of dance and folktales provide the audience with a rich and unforgettable musical experience. George is one of the premiere Israeli-Arab musicians in the country. Schooled in classical Arabic Music, George has been one of the most sought-after performers for many of Israel's top musicians. He has performed and recorded with Ehud Banai, Sheva, Shotei Ha'Nevuah and Machina. George has also performed internationally with Omar Faruk Tekbilek, Yair Dalal, and Ara Dinkjian, founder of the band "Night Ark." George often combines Arabic and Hebrew languages and musical styles into his performances. George believes that all people are brothers and he uses his unique musical and spiritual gift to bring this message to people all over the World.